SHC Mini-Tank Water Heaters excel at supplying hot water at a sink for hand washing or for kitchen applications. An SHC saves water and electricity by putting hot water right where it is needed rather than having a long pipe run from a central hot water tank. The small tank and good insulation reduces the stand-by losses compared with larger tank water heaters and the wait for hot water at the tap is reduced to a minimum. Why store 30 or more gallons of hot water if much less are sufficient for the job? Stiebel Eltron has been a world leader in advanced water heating technology for almost 90 years. Our engineering excellence and high-quality manufacturing results in products fulfilling the highest expectations of performance and reliability and our SHC Mini-Tank Water Heaters are no exception. Mini-Tank Electric Water Heater SHC 2.5 SHC Mini-Tank Water Heaters excel at supplying hot water at a sink for hand washing or for kitchen applications. An SHC saves water and electricity by putting hot water right where it is needed rather than having a long pipe run from a central hot water tank. The small tank and good insulation reduces the stand-by losses compared with larger tank water heaters and the wait for hot water at the tap is reduced to a minimum. Why store 30 or more gallons of hot water if much less are sufficient for the job? Stiebel Eltron has been a world leader in advanced water heating technology for almost 90 years. Our engineering excellence and high-quality manufacturing results in products fulfilling the highest expectations of performance and reliability and our SHC Mini-Tank Water Heaters are no exception. Mini-Tank Electric Water Heater SHC 2.5 is rated 4.3 out of 5 by 57. Rated 1 out of 5 by furryfixer from Within one week, T&P valve began burping/leaking intermittently, creating a big mess. This still ... Within one week, T&P valve began burping/leaking intermittently, creating a big mess. This still happened after flushing and attempting to open and close the valve multiple times. My cold water line has an expansion tank, so there is no over-pressure. Clearly a defective valve. Rated 5 out of 5 by Lucas from Works great.Package came missing wall-hanging bracket, but the mfg. sent... Works great.Package came missing wall-hanging bracket, but the mfg. sent one right out when I called. Rated 5 out of 5 by Mike from Easy to install, works well.... Easy to install, works well. Rated 5 out of 5 by Paul from Was the right product for the right job, small, easy... Was the right product for the right job, small, easy to install and looks nice, has been working now for a week and doing fine. My complaint with regards to this product is the cost, 11 years ago when I installed the one that I am now replacing, the cost for a 2 1/2 gallons hot water heater was about $ 120, now that priced has doubled. Can the tank be put between a tankless system and the hot water feed. This is to reduce the cold water though the lines, before the tankless system fires and heats the water. Yes, this heater can be feed with hot water and is used in this way quite often. Could this heater heat water to be pumped through 300' of 1/2&quot; pex in a loop and stay at a temperature of 75 degrees? No it cannot. The lowest temperature setting on the SHC is 86 degrees F. This is a higher temperature than you want. 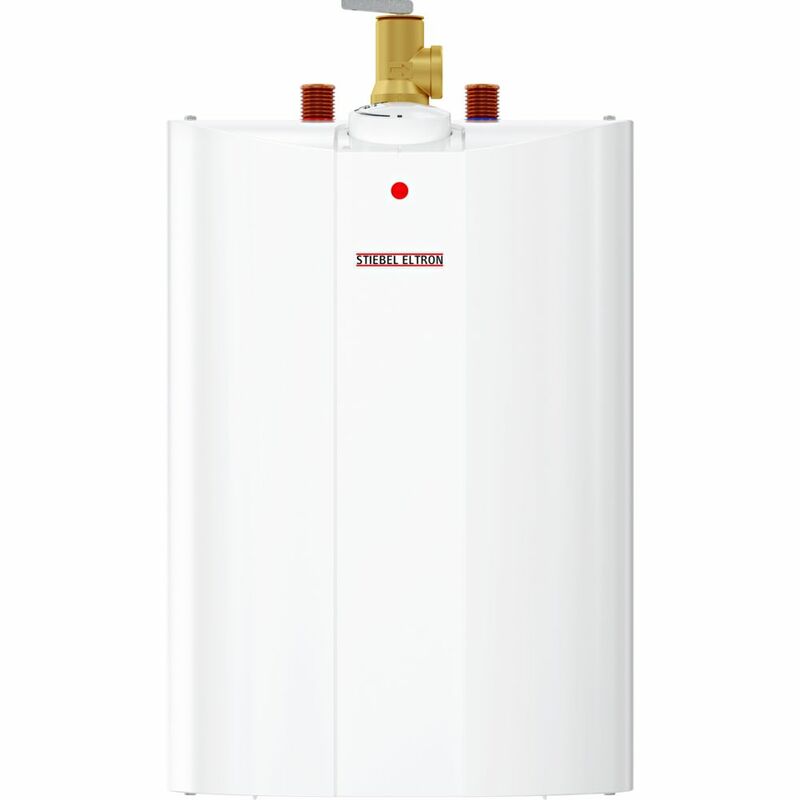 Anyone of our Mini Hot Water Heaters will only provide hot water at its specified flow rate. The maximum temperature setting is 140 F.
How does this unit hold up during the winter months? Could this be used in a cottage that is closed up / no heat in the winter? Like the rest of cottage plumbing, it must be completely drained of all water, and should be disconnected from its power supply. I have a similar unit with over a dozen winters on it. Purge the air out of it in the spring ( turn on the hot water tap until there's no more air coming out of it ), before connecting the power. When empty, there's nothing in it that would be damaged by the cold.